Tea Rose was launched by The Perfumer's Workshop around 1975, and in my mind it is forever associated with that era. It was part of my regular fragrance rotation for many years, along with Diorissimo and the original Halston. It was a very popular perfume at one time. Nicole Kidman made a bit of a stir by wearing it to the Oscars in 2004 when she had just been named the new face of Chanel no. 5, but otherwise you don't hear about it much these days. I can't remember when I stopped wearing it, but I do remember buying Yves Saint Laurent Paris shortly after it was released in the early 1980s, and at that time, it would certainly never have occurred to me to own two bottles of perfume featuring the same floral note. All of which is a roundabout way of saying that it has been many, many years since I smelled Tea Rose. The notes are said to be bergamot, rose, lily, tuberose, cedar, rosewood and sandalwood, but to the extent that the notes ever matter, they certainly don't here. The glory of Tea Rose was that it smelled exactly like a bouquet of roses, fresh and unadorned, nothing more, nothing less. I remember it as very bright, almost effervescent; but it is bright only as long as the top notes last. It has its charms as a rose fragrance, but given the competition from my current collection, it doesn't impress me as it used to. After 30 minutes it smells rather flat and uninspired, and a tad more synthetic than I remembered. It is unimaginable that it has not been reformulated since its introduction, but whether it has changed or whether I simply have a bad memory (or a more discriminating nose) I cannot say. One way in which it is certainly true to the original is in its strength. For an Eau de Toilette, it is very, very strong. I hope I had the good sense in the late 70s to apply it sparingly. One spray is just plenty, thank you. Over the years, The Perfumer's Workshop released a number of variations on Tea Rose, including Tea Rose Amber, Tea Rose Jasmin, Tea Rose Musk, and Rosebud (a sheer version), but I never tried a single one, and for that matter, I don't know how many of those are still in production. You can still find them online. Tea Rose itself is widely available online at discount prices, and turns up at TJ Maxx every so often. I have been searching for a scent called “Sargasso” that was produced by the Perfumer’s Workshop in the 70’s. I have a few precious drops left in the original dark bottle (shaped like the Tea Rose bottle) and have nothing that comes close to it… help! I’d like to find at least one other. I’m sorry, I never heard of or tried Sargasso so I will not be of any help. Might be worth posting a quick query at MakeupAlley’s fragrance board? I’ve used Tea Rose off and on, mostly in the summer. It’s very nice. Perfurmer’s Workshop used to make an oil called Freesia. I’ve looked everywhere for it. For a couple of years I could get it at Saks but only by caling the perfume counter in NY and having it shipped. Not sure if it’s still available anywhere, but I’d love to see it offered again. I didn’t know their Freesia scent…hope you’ll find it! 12 bucks for 4 oz. at Imagination Perfumery, folks. 4 ounces! That’s like a silo in perfume-talk! I can’t remember when I ever owned 4 ounces of anything, OK there’s that Jean Nate splash thingy that comes in a vat. I don’t know anything about that, I swear! LOL. Does it smell like Paris? I see that there’s Paris Rose de Bois, and Rose Enchante spin-off. Is there a Law&Order thingy going on here? Are they all so different? Wow, that is cheaper than I thought….and it makes it even more unimaginable that it hasn’t been reformulated, because it wasn’t that cheap in the 70s unless my memory is even worse than I thought. No, not like Paris, really, although I need to revisit Paris too. It is NOTHING like Paris!! OMG, banish the thought! 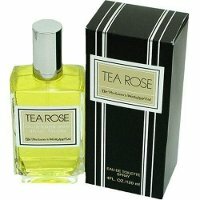 I, having read raves about Tea Rose years ago, saw it at TJ Maxx, bought it and was so disappointed. Synthetic, as Robin says, and just…. ick. Paris is scintillating, piquant, rosy, cinnamony, feminine, happy-making—so right to represent that gorgeous city. The springtime LEs, like Paris Printemps, Premieres Roses, Roses Enchantees, etc are softer, mixed floral variations on the original theme. I haven’t met one I didn’t like. L, agree that Paris is in another class, but you hate Tea Rose far more than I do, LOL at “just…ick”! Would really love to know if it was better in the 70s than it is now. Hey, finally, a cheap thrill! Harder and harder to come by… although I have a bottle of Antonio Banderas Spirit you can have for a song! That’s the hard part of looking up an old love — have they changed? They don’t seem as wonderful. Even with the nicer juice; Chanel Coco is the only bottle I used up entirely, in the 1990s. I smelled it recently, same concentration (EDP) and it smelled completely different — sweeter and less spicy. I’m still scratching my head over that one. Now I’m doubly afraid to try my old love Coriandre! Sounds lovely, especially for the price. I have not tried it, I admit, however perhaps I should. It is a classic in its category, after all! V, you are just the person to hunt down “real” vintage Tea Rose and tell us how it compares! What’s the truest, yummiest rose, in everyone’s opinion? I like 2, although they have very different characteristics: Parfumes de Rosine Rose d’Ete, and Jo Malone Red Roses. I’m not a rose wearer, so I can’t say what’s the truest yummiest rose. For the truest, I don’t think you can beat Creed’s Fleur de The Rose Bulgare, but it is rather hard to find & expensive. I’ve never worn a rose…florals are hard for me. I do love the smell, but they don’t smell great on me. So, instead of the truest, let’s say the best, in your opinions. I have a friend that loves rose, and I’d like to get her something wonderful. Thanks for all of the suggestions so far! Serge Lutens Sa Majeste de Rose is simply gorgeous, or any of the Rosines would make a beautiful gift. Ecume de Rose is my favorite, but they are all well done so just a matter of picking the notes you think would most appeal to your friend. Now that is a blast from the past…maybe better left there? Well, looks like I am “free at last,” and will be back in touch with you and your wonderful blog. OMG…this is so amazing! I saw “the moment” when Nic Kidman was asked what she was wearing & she said “Tea Rose”. I was so amazed that I emailed Chanel & asked them if this was a new fragrance they were coming out with: since NK had just been named their Chanel #5 spokesperson. I received a polite email in reply saying that “tea rose was a component of Chanel #5” yada yada yada. Now I find out it was THIS Tea Rose she was wearing! Can anyone say faux paz? That is so funny, C, because I am quite sure Chanel knew exactly what she was talking about — it created a stir that she wore a non-Chanel fragrance. I enjoyed your post, it’s a great blast from the past. I wore Tea Rose in high school and I have great memories. A friend of my mother’s who is French introduced me to it in 1979, so I always considered Tea Rose a chic and cheery scent. I bought a bottle a year ago for old time’s sake, but I rarely smell it. I have gone on to Caron Or et Noir and Creed FdTRB as my rose scents! Thanks for bringing it up! Brambled, we must be close to the same age. I thought of it as chic & cheery too, and so was surprised to find it neither. Do wish I knew if it was the fragrance that has changed, or just my own taste — what is your guess, has it been massively reformulated? M, you might be right, perhaps it was never as gorgeous as I thought it was! Thanks for the trip down memeory lane. I too wore this, and the beautiful Halston which was released while I was in college. I couldn’t return to TR, but have revisited Halston over the years, and only one bottle of many came close to the original perfume I remember. I see it in the Cologne and EDT selling very cheaply. Do you know which formulation is closest to the one we wore? Robin, I love your blog, reading it is one of the highlights of my day here in Sydney. Thanks to your brilliant reviews I now have in my collection the OJ samples, OJ Frangipani, VL samples, a PoTL sample and other fragrances I would not have know about . I have not smelled Halston since the early 1980s, and my experience with Tea Rose was not very encouraging — not sure I’m dying to seek it out! So far, Eau de Givenchy & Diorissimo are the only 2 scents I wore back then that seem to have successfully weathered the years. Two people have given me samples of Coriandre, another favorite of mine from “back in the day”, and eventually I’ll try it but sometimes I wonder if it isn’t better to keep the memory. I too wore Tea rose in high school and my boyfriend loved it! Now as my husband he wants me to go back and wear it, but after finding it, I don’t like it. I want something lighter,a little more sweet. I have tried Babydoll, but it smells too much like grapefruit on me, but like roses on my daughter. I have tried the new Stells also and hated it, much too heavy and didn’t smell like roses at all. I’m wondering if you would like one of the Parfums de Rosine fragrances, maybe Ecume de Rose or Un Zeste de Rose or Rose d’Ete? I need to find a place online where I can get samples and try them before buying. I am very light skinned , so the heavy orientals or spicy fragrances smell bad on me. I will have to look those up and see the note descriptions on them. Lusciouscargo & Aedes both have the line, or Barneys if you have one near you. I am trying to get samples from Ebay. One seller on there is selling 8 samples of de rosine parfum. I thought it would be a good way to try it. I’ve learned not to buy the whole bottle just because it sounds good. Thanks for all your help and I’ll let you know what I think when I get them. 8 samples of Rosine would be perfect, hope you’ll win the auction! I’ve always liked this fragrance, although I will admit to knowing women who used ten or twenty times too much, and trailed a practically visible cloud of virtual roses. I also very much liked the other floral fragrances that The Perfumers Workshop once sold, especially the ones based on Lilac and Freesia. The former was called Lilas, don’t remember the latter. The lilac fragrance was a note-perfect replica of the June smell of blooming lilacs, and simply wonderful (if you like that kind of thing). It was easy to overapply, agree! I don’t know that I ever tried the others, or if I did, I’ve forgotten them — Lilas sounds like something I might like now. First time poster, hello! As a newbie perfume collector I knew I had to own a bottle of this, and at $10 for 2 oz it was easy. The first thing I noticed was the COLOR. The juice is the color of Gatorade, a deep yellow-green. Or Galliano. Is that normal? I liked it well enough, but my husband (who is a wine expert) told me it smelled like “TCA” (a common garbargy-papery flaw caused by a bad reaction with the cork). At first I didn’t get it, but then I did, and now that’s all I smell. I don’t think my bottle is spoiled; I just think that there is something in a pure rose fragrance that is reminiscent of TCA. Please any wine experts comment if they understand what I’m saying. As regards “Paris,” that is the perfume one of my girlfriends wore in high school, and I will forever associate it with her. A darling girl, I partly named my daughter after her. Hi and welcome! I’m not a wine expert and don’t know the term TCA, sorry, but my bottle is about the same color as yours. If you want to try a more expensive soliflore tea rose, you might sample Creed’s Fleur de The Rose Bulgare. I do not know if it is made anymore, but suspect it is not because like you, I don’t see it. And if Perfumers Workshop has a website, I’ve never found it so it’s hard to tell what they still produce. Sorry not to be more help! Well, you know, maybe they do have a website. I spent some time searching around for one at the time I wrote this article, but haven’t looked since. I was searching just the past couple of days and there’s no sign of one. I did find someone in Germany who had a bottle of the perfume for sale (still sealed with the box) and promptly bought it. It’s from the same era as mine, so I’m really looking forward to it. I found a mini that looks newer (the bottle is different.. it looks like a rosebud stopper in the photo) and will let you know if I notice any scent difference when I get them. I’m so thrilled… the bottle I ordered from a seller in Germany arrived today! It’s still sealed, so would imagine it is as it was in the 80s. Both it, and my opened bottle from the same era are a much darker color than the mini I got from someone in the US (which is more yellow/green). The mini does have a more alcohol smell than my old bottle. It has content info on the back of the box, but not being a perfume pro, I can’t tell if it means it’s truly the perfume or a lighter version. The vintage bottle actually says Extrait on the box (no content info, though). The two older bottles smell the same, and they’re both extraits. It’s all strong, rich rose – no bright green smell or alcohol distraction. The new mini edp is very similar to the edt that is widely available (in fact, they are nearly the same when you compare those two to the extrait). I smell more green-y bits in it, and am aware of the alcohol. It could be that people comparing the old vs. new are just noticing differences in the two strengths. I see a fair number of new edp bottles out there, but no extraits. If someone wore the extrait originally and are now using the edp, it’s definitely not going to be the same. Huge thanks for the detailed description! You’re welcome! I’m glad there’s a site like this one since I’d never really considered that perfumers changed formulas over the years, to the point that it was noticeable. Now I can learn about any potential pitfalls with favorite scents. Thanks for that! I remembered this fragrance from years ago and recently bought a bottle for $10 @ Marshall’s. I love the simple sturdy looking bottle – looks great in the bathroom. This is such a true soliflore, it’s hard to detect any other notes. Nothing but roses. All rose, all the time. That’s ‘Tea Rose’. In the dead of Winter, I enjoy it after a relaxing bath later in the day. Since I’m a potpourri maker, I’ve always had a ‘thing’ for roses. Most of my potpourris have rose petals and/or whole buds and flowers – so most of the scents I put together have at least a hint of rose in the composition. I enjoy most rose perfumes that I try. But, that said – i don’t think I could wear Tea Rose out and about anymore. I prefer something not so obvious, I guess. I don’t think I’d wear it out & about these days either, but I sure used to…and so did many people, I remember smelling it on others as well. I saw this on a chemist reduced to clear bargain table for $14.00. I didn’t buy it then thinking “$14 is a little cheap” but I was curious and thought about going back to buy it. A girl I work with bought in ‘Perfume: The Guide’ which reviewed Tea Rose as 4 star. I dashed out during my lunch break and grabbed that bottle off of the ‘cheap table’ quick sticks! Really I am not disappointed with the perfume especially at that price. This perfume challenged my normal instincts (because lots of cash was not on the line!). At first sniff its stale – like dusty potpourri long ignored on a sunny side table. Over the next 30 seconds (and with an open mind) the perfume seems to rise from the dead! Effervescent, sparkling snatches of green, dewy rose seems to rise up and diffuse at unexpected moments. The perfume finishes on the skin with a very pale fresh linen, very comforting. This was quite a ride! So glad you liked it! Can’t beat the price. Well, it’s been a few years and I’m still searching for Sargasso, or something like it… I came close with a scent from Annick Goutal called “Eau de Sud” but it’s not exact. I guess that’s the elusive beauty of scents! Please pass my e-mail along to anyone who knows of Sargasso by The Perfumer’s Workshop. Thanks for still listing this! Sorry you still haven’t found anything! I sure love the name – one of my favorite books is Wide Sargasso Sea. I wore this Tea Rose in the 70’s and on…. Every single time I wore it, people would say how much they loved it…. Every time! Strangers would stop me on the street to ask what it was. Then I bought a new bottle and had it in the box next to my old bottle in the box and noticed the brownish color of the box was so different. At the same time, people just stopped commenting on it entirely! I did some research and found that the company had been sold around the time of the switcheroo…. sad….. I’m sure it is a cheaper version to make… sigh. It is true, it probably does not smell quite the same as it used to. when I was sixteen years old. I finally run out of it. And been looking for it ever since. We are not a store. I picked up a 4 oz. bottle at TJ Maxx for $10 this morning and had to rush home to read your review. You’re right, there is nothing complex here. It’s just a very lovely, old fashioned rose. I may be smelling a hint of sandalwood, but it could just be faded rose. I may go back tomorrow and get the other bottle so I can use one as a linen/room spray. This is one that could be sprayed on silk flowers and people would think they’re real. It would make a perfect linen spray, great idea! Thanks. Not at all sure I buy #2, but hey.